PIA offers many programs and courses to help international students learn English, both for university and for everyday life. A program overview is provided below. For more details about each program or course, click on the links. 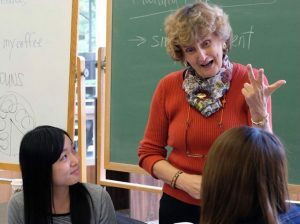 Intensive English prepares students for English-language university study through a series of classes in grammar, reading, writing, and speaking and listening. Completing this program meets the language proficiency requirement at area colleges and universities–no TOEFL or IELTS testing necessary! These classes give students the knowledge, skills, support, and connections they need to volunteer at nonprofit organizations in the Portland area. PIA offers customizable culture and English courses for groups throughout the year. Experience America, a four-week course, is offered in the winter and the summer. Additionally, short-term English courses of one to four weeks can be customized to match students’ desired focus areas. PIA provides many student support services, including tutoring, workshops, and conversation partners. PIA also provides courses for students interested in preparing for the TOEFL, TOEIC, and IELTS, as well as volunteering. Click here to download a PDF of the current course catalog.